A new private venture aims to sell manned trips to the moon by 2020, its founders announced today (Dec. 6). The company, called Golden Spike (after the final spike built into the First Transcontinental Railroad), plans to sell each moon mission for about $1.5 billion — a relative bargain, said the company's president and CEO Alan Stern, a former director of NASA’s Science Mission Directorate. For the same price as many unmanned robotic missions, Golden Spike will provide a round trip for two humans to the moon. Stern and Golden Spike's chairman of the board of directors, Gerry Griffin, a former Apollo flight director and NASA Johnson Space Center director, announced their plans today at the National Press Club in Washington, D.C. The company's leaders have not yet chosen a launch vehicle or space capsule to transport their passengers; Stern expects to make the final selections in 2014. To keep costs low, Golden Spike will likely use existing or already-under-development rockets and spacecraft. However, the company will need to commission its own lunar lander and specially designed spacesuits. Stern called rumors that Golden Spike had already chosen SpaceX's Falcon 9 Heavy rocket "not true." The company has been in the works, and under wraps, for two and a half years, Stern said. "I don’t think anybody's got us beat," he added. "This is state-of-the-art cool." The missions are being targeted at countries without their own space agencies or that can't afford to launch people to the moon independently, as well as scientific organizations and even private individuals looking to take the trip of a lifetime. "We have spoken to space agencies from both Asian and European countries and found real interest," Stern said. 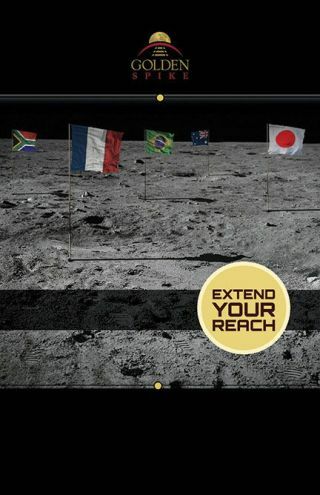 This Golden Spike Company flyer outlines the organization's vision of commercial human lunar missions. This isn't the first private moon-bound venture. The Google Lunar X Prizeis offering $30 million to any nongovernment entity that can land a robot on the moon that travels at least 1,650 feet (500 meters) and sends data and images back to Earth. Stern himself is involved with one team called Moon Express vying for the prize. However, no serious company has aimed to send people to the moon. Each Golden Spike moon expedition will involve four separate launches: two launches to get the lunar lander into orbit, and two more launches to transport crew and cargo. Golden Spike's leaders hope to fly regular missions throughout the 2020s. The venture doesn't have a long list of wealthy backers. "We don't need it. We're going to make our business run on sales," Stern said. The project does have the support of an advisory board made up of scientists, aerospace company leaders, movie producers, and dignitaries. One member is Homer Hickam, author of the book "Rocket Boys," the inspiration for the film "October Sky." "A reliable pathway to the Moon — 'Earth's eighth continent' will open our nearest neighbor in space to extensive new exploration, and also open it to the imagination of people everywhere," Hickam said in a statement. The team chose today to make the announcement because it's the eve of the 40th anniversary of the last launch to the moon, Apollo 17, which lifted off Dec. 7, 1972. "We looked for a meaningful date, and we picked today," Stern said. "There's a little bit of poetry with this."